On packetpushers.net somebody wrote an articel about automatically get the outputs of show command of the cisco asa with lynx. That makes it possible to see if a specific counter for a feature, service or process or just interface counter changes, mainly increases, but you cannot see the size of the increase. In troubleshooting it is a key information if a specific counter affected by an issue, changes too much, but we cannot be sure if it really affects the current problem we have or not, if we check it only when we got some problem. Thats why we should monitor it/graph it to have better understand how much the suspected counter in case of an issue is relevant. A really easy example if we have a layer 2 problem and we see interface drop counters increasing we can thing it is relevant to our issue, but we dont know if the drops were there before our issue or not. It can mislead us if we havent checked them earlier when there were no layer 2 problem, but maybe there were drops earlier too. Showing it on a graph can give us more information than just identifying a general increase, it can show us a true anomaly. In network enviroment the mostly used monitoring service is snmp, but there are other ways as well to monitor our network devices. 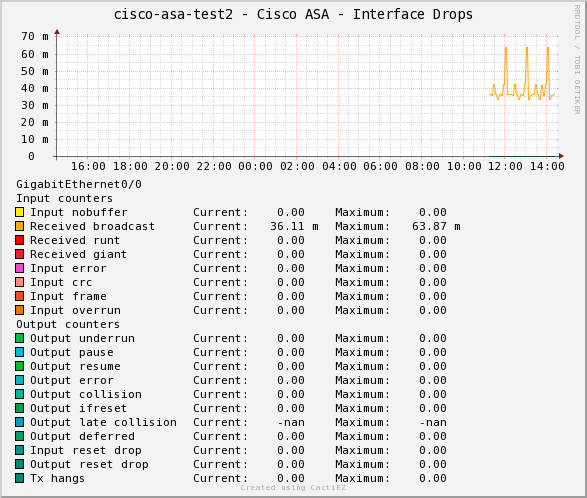 Just to show that for you I did some pictures about asp drops and inpsection drops and vpn traffics from a cisco asa firewall with perl scripts (without snmp!). 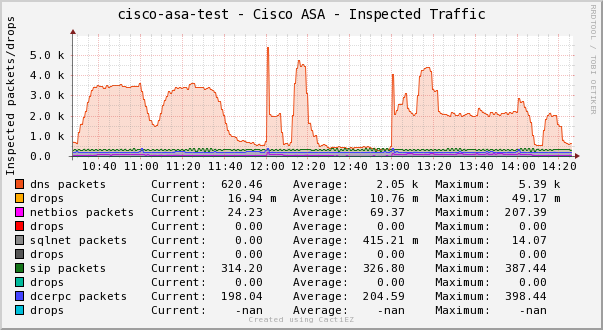 Monitoring ASP Drops on Cisco ASA 1. Monitoring ASP Drops on Cisco ASA 2.
designed as a front-end application for the open-source, industry-standard data logging tool RRDtool. I made a topology of the settings from Cacti to be able understand easer what the tousand Menus are for and what we need from thore. 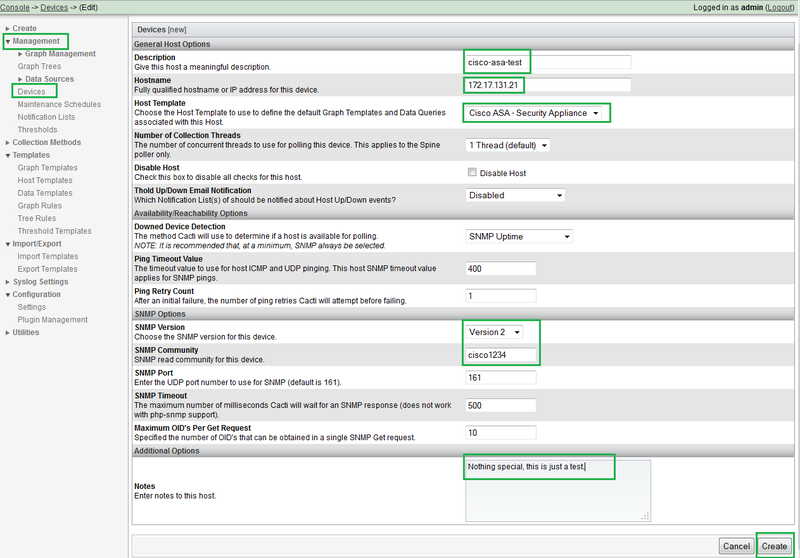 The difference between simple snmp query and remote script is a step where you define a new Data Input Method for the remote script. 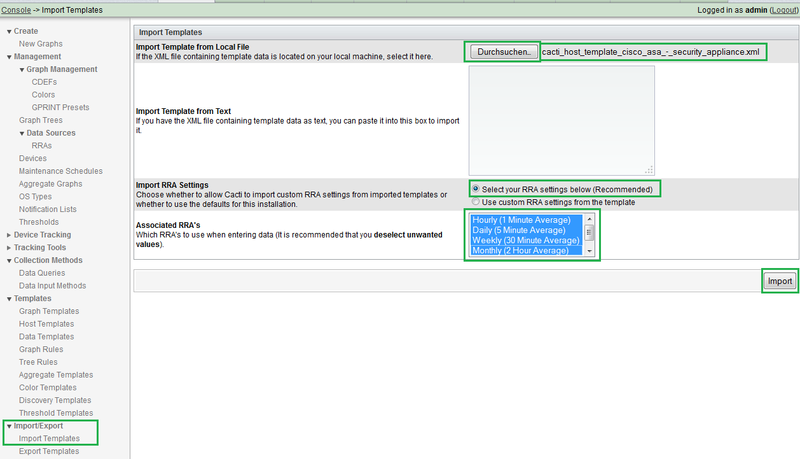 For simple snmp query there is a built in Data Input Method. Data Template This is the interface between the script output values and the data sources of rrd. The type and min, max values and the heartbeat will be defined here for data sources. Data Source Here we will define with which data template and with which device should we take the values to be presented in the graph. The actual rrd file. Device This represents the monitored device, that was earlier configured with an IP address. This has nothing to do with rrdtool. Graph Here we have to define which device with which graph template should be presented in a graph and for the graph template which data source to use. The issued rrdtool graph command can be seen here. The next step, if you are not a Cacti expert or have any experiences with Cacti, is to insall Cactiez. The Cactiez is a simplified installation of Cacti on Centos. Set Language and timezone, clock and keyboard language. Set the operating system user, the root password. Set Partition table, use full disk on virtual machine. At first login install the plugins required from default list. See the list I activated in the screenshot. At first login install the templates required from default list. See the list I activated in the screenshot. Set the DNS and Email Address for Cacti too. The default usernames and passwords are documented on the official site. 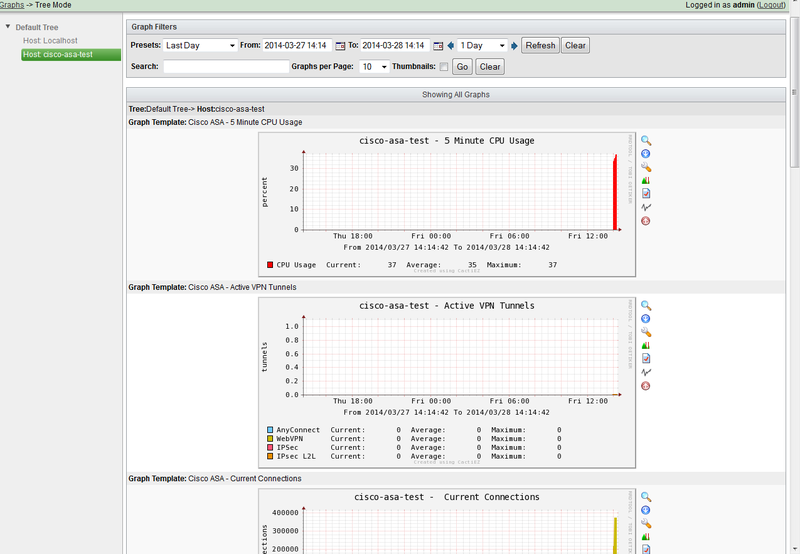 If everything is fine, you should see the following graphs of the cisco asa currently imported. 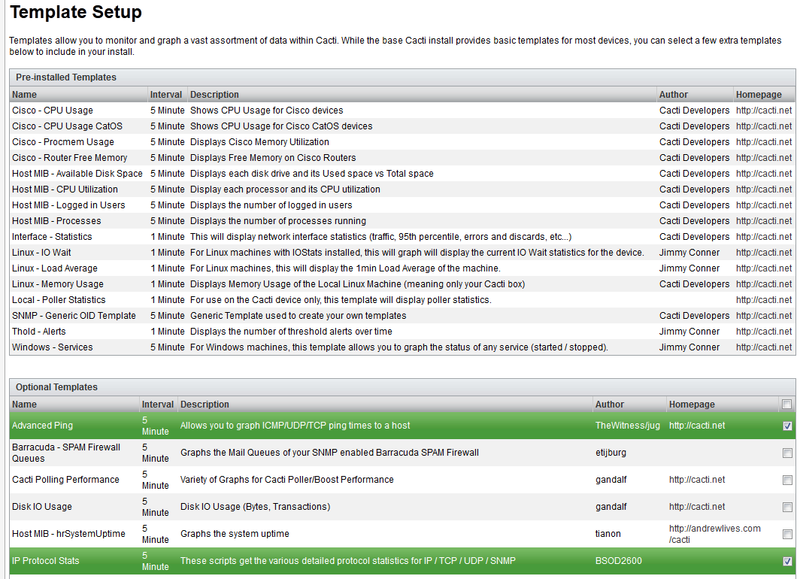 The values, you can see on the new graphs from the new cisco asa device, are mostly return values through SNMP Queries. You can get this vaules with snmpwalk command too if you wanna test it. SNMPv2-SMI::enterprises.9.9.147.1.2.2.2.1.3.40.6 = STRING: "number of connections currently in use by the entire firewall"
SNMPv2-SMI::enterprises.9.9.147.1.2.2.2.1.3.40.7 = STRING: "highest number of connections in use at any one time since system startup"
On the following link you can see some other snmp queries for Cisco ASA VPN. The cisco asa has a lot of show commands to check for example the actual state of its interfaces, processes, inspections, vpn states and so on. Not all of those states/values have currently snmp extensions, but with a remote script it is even possible to graph everything, for example the different counters of asp-drops. 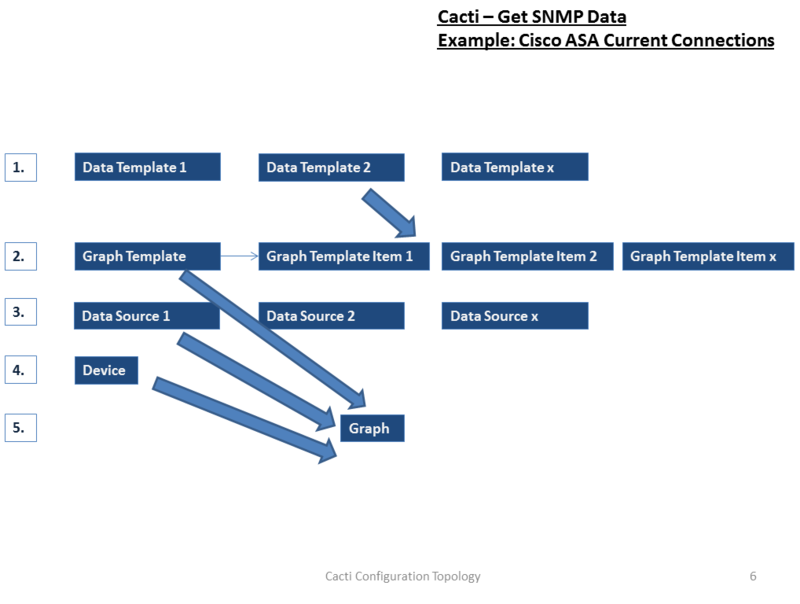 The currently available SNMP MIB for Cisco ASA can be checked here. Maybe there is already an OID for the thing you are looking for. To be able to use custom monitoring first lets see how a remote perl script works before we start to create our own monitoring. In the cacti configuration you can save your username and password only in clear text. It is not required if you use ssh public keys with ssh, since the newest cisco asa software makes it possible to login with ssh public key. It an be your homework if you feel the power and you can create a new script without lynx and only with ssh modul in perl. # This is a rather crude and quick hacked Perl-script to get multiple values from show asp drop command. # The drop reasons (max 5) should be defined in command. 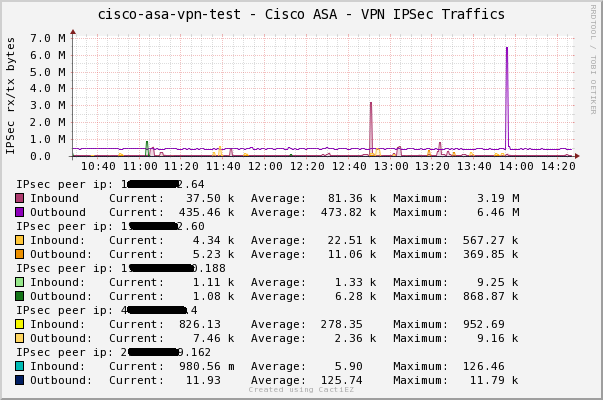 #  : The IP of the cisco asa firewall. #  : Username for a readonly user. #  : Password of the user. In the output you cannot see the names of the drop reasons, but the position given as argument in the command. Cacti will use this information. If you do not want to create the input methods and data templates and graph templates on your own you can use my exported template. I have exported the graph template with all dependencies. Just import it if you do not want to bother with the cacti configuration. 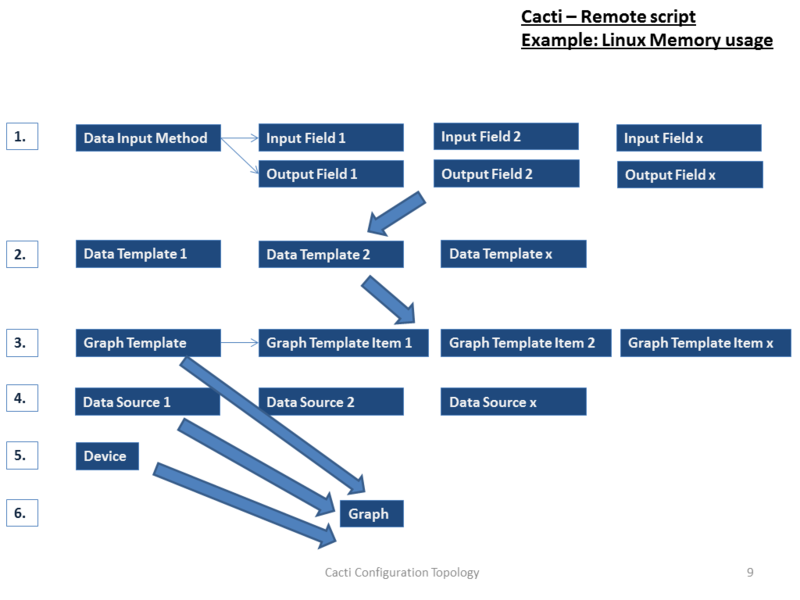 Import the xml file in cacti as graph template and put the perl scripts to your_path_to_cacti/scripts/. In my case it is /var/www/html/cacti/scripts. Hello, very useful. Asp drops is working fine. I was also interested in get_asa_interface_drops.pl perl script but actually there is not xml file graph template for it and Cacti_Configuration_Steps.pdf is missing. 1. import the xml file in cacti. 2. upload the perl script to cacti. 3. the rest is a general cacti settings. Should I demonstrate it for you with a youtube video? got it working now :) but how can I have ge int names on graphs ? and download the xml file for interface drops again. If you wanna understand what I did to see the interface name on graph, please read further. Can you start a perl debug and check the variables? Or should I add control points to the code? This example really helped to take ASA monitoring to next step. we have made other monitor as well and replace lynx with curl.